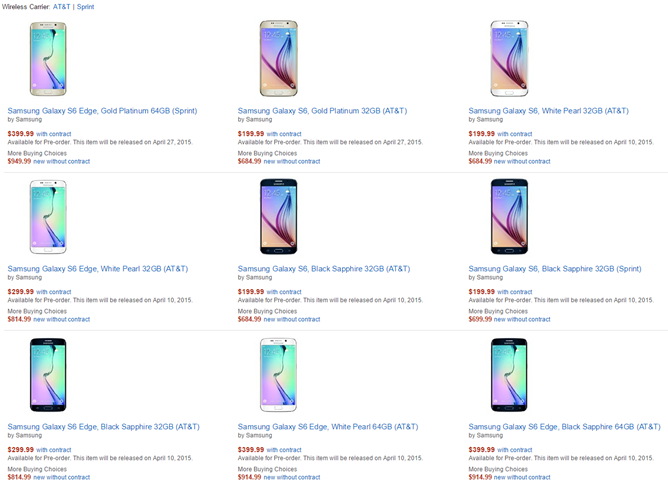 Just about every American carrier is eager to take your pre-order for the new Galaxy S6, Galaxy S6 Edge, or HTC One M9, but if you prefer to get your phones from Amazon, they'll happily take your money too. Right now it looks like the only way to buy the phones are through the carriers, complete with the various lock-outs on AT&T and Verizon models, but you can purchase them with new contracts, renewed contracts, or contract-free. At the time of writing the One M9 is available in 32GB for Verizon, AT&T, and Sprint, with prices ranging from $199.99 to $749.99. Only the black model has been made available. 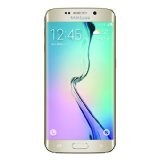 The GS6 gets a lot more variety: On AT&T and Sprint it's available in gold, white, and black, and in 32GB or 64GB capacities. Ditto for the GS6 Edge, though those models are $100 more expensive each. Prices range from $199.99 for an on-contract 32GB GS6 to an eye-popping $949.99 for an off-contract 64GB GS6 Edge. Oddly there are no Verizon variants of either Galaxy S6. There aren't any 128GB models of the Galaxy phones either, but that's hardly surprising. Keep in mind that Amazon has to deal with each carrier individually, so more models are likely to become available at some point, along with unlocked versions sold by third parties. If you're waiting for a deal, I'd suggest you keep waiting - Amazon's official wireless offerings often go on sale a few months after release. All three phones are officially available on April 10th, but you might just get them sooner.